Day 11 of the 13 day Sound Dreaming CD Concert Countdown. Today I am writing about the second line of my title for the CD: “Oracle Songs from Ancient Ritual Spaces”. Often I’m asked what kind of music I do, what type of singing I do. I find it hard to put it into a well known label. One day I came across the word ‘oracle songs’ to describe the pieces I had created. As in the age-old tradition of the sibyls, seers and oracle priestesses who used a variety of ways and means to divine wisdom and receive guidance, I realized that in working with the voice and the power of sound frequencies I was intending to access deeper layers of memory, connection and wisdom. It seemed to be similar to what this more ancient tradition was all about. Thus the phrase ‘oracle singing’ seemed to fully embody what I have been doing. In choosing this name, I also realized that these pieces were part of a larger picture of what I’ve been cultivating over many years - which I’m calling a sound oracle process. This process involves using the voice as a way of receiving wisdom, guidance, and connection through aligning with an intention or question. Using the voice is also a way of divining the sound stories that live in the land, in a particular place, that are present in the waters and trees, and in the ancient sacred places. It opens up one way of connecting with mythical and archetypal consciousness, the legends and characters of specific places. It is a way of receiving wisdom from the earth and establishing a deep relationship with the spirit of Gaia. A dialogue and communion. Through the voice, we can connect with the deeper wisdom that dwells within us, and with the larger sacred field of life. It is a process of opening, aligning, listening, and receiving, and a practice that is constantly unfolding and circling around, spiral-like. It is an attunement to the creative impulse that lives within us and in all forms of life. It is an act of ‘subtle activism’, for we are participating in the restoration of humanity’s relationship with the earth and all creation. It’s a way of being and living with sound that is opening itself like a pathway and to creat community with. It’s become a core part of my life’s work. 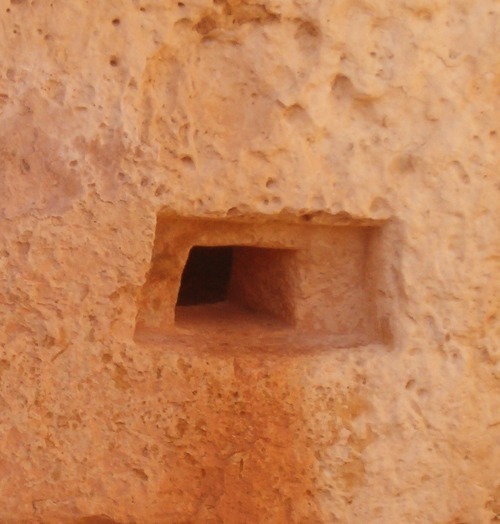 The picture today is one of my favourites - an Oracle Hole in one of the walls from the Mnajdra Temple, Malta. The darkness of the hole pulls us into its mysteries, much like when we drop fully into the body and breath, we can access unique sounds that can bring us into resonance with our truest self. What is the oracle sound revealing today?